These instruments date back to the 18th century. From the time of the developement of compound instruments, projection became an important idea. In fact these instruments, particularly the Solar microscope, provided an opportunity to provide entertainment as a 'Solar Microscope Exhibition' for which an admission fee was charged. Imagine the amazement back then as a flea was magnified to a six foot wide image on a screen. They are 'Solar' because the bright light of the sun was used as the light source. Historians have traced the idea of a solar microscope back to the Camera Obscura, a small opening inside a darkened room, allowing an image of the outside landscape to be projected on a wall inside, providing it was bright daylight, and the room darkened. In time, an improvement was to use a lens in the hole to improve the image and eventually, it was also used to project an image of the sun to allow viewing of sunspots. The lens could swivel in a wooden fixture and became known as a 'Scioptic Ball.' The first use of this to project a microscopical image was the adaptation of a screw-barrel microscope to be attached to the ball. The disadvantage of this type of solar microscope is that, as the earth rotates, the sun's apparent position changed in the sky, and the ball had to be moved to follow it. As this was done, the location of the image inside the building also changed. For a substantial part of the day, the image had to be projected onto the floor. Around 1700 some workers apparently used a separate mirror to reflect the sun's rays into the projection device, but this required an attendent outside the projection room as was very difficult and inconvenient to accomplish. Apparently Fahrenheit was the first person to integrate a mirror and a projection device producing the first practical solar microscope and Lieberkuhn shortly thereafter did the same. Benjamin martin attached a mirror to his "Scioptric Ball" but this was not an improvment on Fahrenheit's design. It was John Cuff who first invented a Solar Microscope in which the optical tube remained stationary and the mirror moved, controlled from inside the room. Early models used a push and pull mechanism to adjust the mirror using levers, but starting in the last quarter of the 18th century, geared adjustment became the usual. This arrangement continued for at least the next century, and this type of Solar Microscope was made by many well-known 19th century makers including Pritchard, Plossl, Chevalier, Dolland, Soleil, and many others. Most solar microscopes until 1774 were designed to show only transparent objects, but in that year, Benjamin Martin announced his newly constructed 'Opake Solar Microscope' which used a mirror box to project the image of an opaque subject; the opaque solar microscope was subsequently copied by other makers, and sometimes a solar microscope was furnished with both an attachement for transparent viewing, and another for viewing opaque objects. Opaque solar microscopes are rather rare today and few collectors possess one. In the 19th century Goring, a famous microscopist, was critical of the quality of the images produced by the solar microscope as being only an enlarged blurr of a subject and grossly inferior to an ordinary microscope. While this might be true for high power work, this is certainly not the case with lower power lenses which project beautiful enlarged images of things such as insects very nicely (as evidenced by my own experience with one of these instruments in actual use). 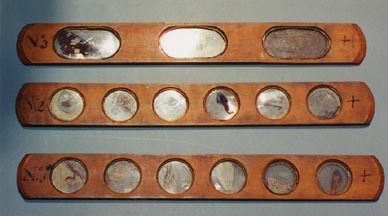 This collection, like those of many private collectors, contains only one solar microscope, but used to contain another as part of a compendium, and another is referenced. There are many more examples in museums and collections around the globe. The lucernal microscope was invented by George Adams, the elder, described in 1787. These were made in several forms, commonly with a wooden projection box. An occasional all-brass example also was made. Most of the old lucernal microscopes were quite fragile and few have survived. Most are in Museums. The principle involved became common and lucernal attachements to microscopes were common, even in the twentieth century until replaced by electronic imaging systems. A toy version of a dedicated lucernal microscope is in this collection. This collection contains a single dedicated French solar microscope from the 19th century, and a toy type of lucernal microscope from the 20th century. 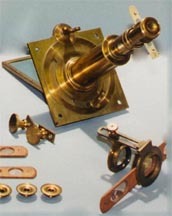 A Solar microscope also accompanied the Benjamin Cole compendium also seen here and a picture of part of a Soleil Solar (from another collection) can also be found here. There are also some Solar Microscope Slides by Bourgogne in the collection. These are all listed in the single table below.